The thing I’m cherishing most as a new mom is being able to spend so much time (day and night!) with my Isla Rose. Lately because of random rain storms or really no desire or energy to get everyone ready and out of the house, we usually find ourselves cozied up at home – which has become one of my most favorite places to be! Although I live for her cuddles and our 24/7 time together, I’ve discovered that (believe it or not) life goes on after you have a baby! Haha. It isn’t always easy juggling all of the responsibilities and getting everything done in one day. I’m reminded daily that there’s still a house that needs cleaning, clothes that need washing and folding, errands to be ran, and work to happen. 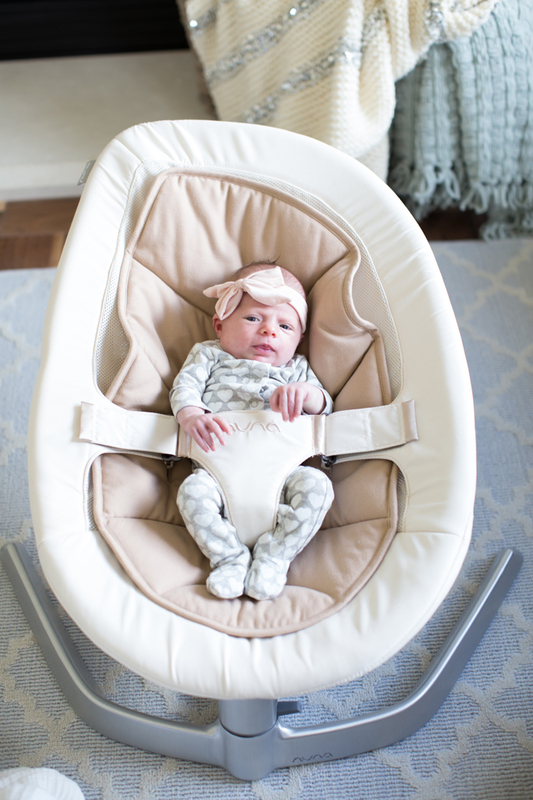 Whenever I need to I use my Nuna LEAF bouncer and my Isla girl loves it! It’s easy to use and move around the house whether I’m in the kitchen cooking or in my bathroom getting ready for the day, or just on the floor of our living room playing. And when she gets a little bit older, I’ll be adding the LEAF toy bar to keep her busy and entertained so that as she grows her bouncer can grow with her! She never leaves my side, but when I need to get things done around the house, I’m comforted knowing she’s safe and happy by my side in her Nuna LEAF bouncer. Isla Rose is so cute, Rach! Dasher boy is playing to be your bodyguard, haha! So cute! Isla Rose is so cute! Love her bow! What a sweetheart! That bouncer looks really cool! Isla Rose is so lovely and the pictures are so heartwarming! Thanks for sharing! So sweet! She is just darling! Love that little bow! How sweet are these pictures!! What a beautiful little girl:) Thanks for sharing! She’s just too cute…love these pics! What a gorgeous living room! Your home is amazing! Lovely photos… Isla’s onesie is very cute!! We’ve had a lot of rainy weather in Chicago, too! Definitely a summer bummer… ha ha… I’m so cheesy! She is seriously so precious! I think your giving me baby fever now!! She is so sweet! Looks like Dash is a great big brother :) love your cute yet comfy sweats, too! So cute!! I love how every time I see Isla, she has a bow on her hair!! I really like that T-shirt you’re wearing!! obsessing over Isla Rose! she is too cute for words! Snuggles are the best! So are bouncers actually! What an adorable family! Continued congratulations! Isla is precious! Congrats and enjoy this special time. I can’t help but notice your beautiful leather couch! Where is it from? Beautiful pictures! Love your rug….where’s it from? So sweet! You are just the most adorable mom! Darling! Isla Rose is such a gorgeous baby!!!! Such a cute post into a typical afternoon :) Isla Rose is a beautiful name! Beautiful! May I ask where the rug is from? She is an absolute doll! What a precious girl :) I do not have any children of my own yet, but I look forward to little babies to cuddle! I just came across your blog and Isla Rose is absolutely the sweetest name ever! Also, the lovely pastel color palette in this pictures is just so awesome! Aww she is so precious and that bouncer looks adorable!! It looks like you are having the time of your life with your new baby girl! Congrats!! Beautiful photographs! And I absolutely love the soft colours you’re wearing! Motherhood suits you – welcome to the club! Such precious moments and photos! Your baby is adorable, Rach!!! Adorable photos! I love all the little outfits you dress Isla in. Enjoy every second with the baby because they grow up so fast! She is so beautiful! Such an adorable baby! You look super comfy. She is so adorable and you guys look so cozy cuddled up! You are the cutest mama! Looks like a perfect item to have when I am a mama! Thanks for the post babe, have a great day! I did the same thing with the bouncy seat too. Sometimes even just to use the restroom, so you can be hands-free, it’s nice to have. It’s a great, safe place to put them at this age when you need to get things done. I also wore my daughter in an ergo carrier too although next time if I have another baby I’d choose a sling wrap style instead, friends swear by them to keep them close to you. Sometimes though it’s just not necessarily the most practical to have them attached to you while doing certain things. Love these sweet pictures! Isla is so adorable! Baby, mommy and dog in pastel room! what else is cuter than this? Cuddles are the best! Such a fun time. Love these pics, Rach!! I’m so glad you are cherishing all of these precious moments. It is very hard at first to find a balance with every day things that go on. I’m glad you have a special bouncer that Isla loves to allow you some hands free time to get work done. By the way, it’s so wonderful to see you in lounge clothes! I always change into my comfy clothes when I’m at home. You still manage to look so glamorous! Your hair is getting so long! I love it!! So beautiful. Isla and Dasher are so adorable!! AMAZING pics! Isla Rose is the most gorgeous little baby ever!!! Juggling everything really can be a struggle even if you aren’t a parent so I can only imagine how it gets even trickier when you have a child to consider. Your baby is so beautiful ..congratulations!!! Come see my picks for the perfect Summer ready LBD’s! Hi Rachel! Is that a Moroccan wedding blanket I spy in the background of these photos? If so, can I ask where you got it? And I can’t believe that even in “mom clothes” (t shirt and sweats basically) you can look THAT beautiful! Isla and Dasher look super cute! I’m glas you’ve said that life goes on after having a baby. That really scares me- that I will lose myself and my identity once I have a baby. Hi Rach! I absolutely LOVE your floor lamp that is next to your sofa. I’ve looked everywhere for it and can’t find it. Would you mind letting me know who makes it? That would be SO helpful!! Precious Isla is such a beauty by the way! Thanks so much!!! I would love to know the source of your light blue rug and pillows. We just bought our dark leather couch for the family room and I am trying to lighten the room. I love you decor – any help would be much appreciate. Thanks so much!